Situated 5 km from Black Lake Gramado and 5 km from Mini Mundo, Apt temporada Diego is in Gramado and features barbecue facilities and a garden. 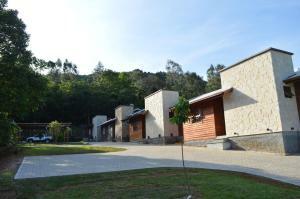 The property has mountain and garden views, plus is 5 km from Gramado Bus Station. This air-conditioned holiday home comes with 1 bedroom and 1 bathroom equipped with a bidet and a hair dryer. The kitchen is fitted with a microwave and a toaster. Saint Peter's Church is 6 km from the holiday home, while Festivals Palace is 7 km from the property. The nearest airport is Hugo Cantergiani Regional Airport, 69 km from the property. When would you like to stay at Apt temporada Diego ? This property will not accommodate hen, stag or similar parties. Please inform Apt temporada Diego in advance of your expected arrival time. You can use the Special Requests box when booking, or contact the property directly with the contact details provided in your confirmation. Each day we'll check prices and send you an email for your selected dates at Apt temporada Diego. If you don't have specific dates but would like to check prices for say next weekend or say next month we can check the price too. Click to write a review and share your experience of Apt temporada Diego with other travellers.